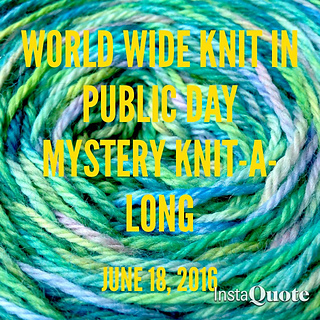 This year I’ve had the pleasure of organizing our local WWKIPD events and as part of the festivities (and to add my own little twist) we’re going to be doing a Mystery-Knit-A-Long Pattern Scavenger Hunt! I’ve priced this KAL super low (only $1) to try to keep it accessible to as many knitters as possible so please share the info with as many friends/knitters as you can so we have a huge group knitting together both online and in public. ETA: I’ve created a Ravelry Event Page Here. When you post about our event on Ravelry, Twitter, Flickr or on your blogs, please use the tag: WWKIPD2016MKAL so that your posts show up on our event page. The finished project is a long skinny crescent-shaped mini-shawl with a slight point in the center (approx 10” x 40”). It incorporates lots of squishy garter stitch alternating with layers of textural stitches and some simple lace. This combination gives you enough of a challenge to keep your interest while also giving you time to just knit while you talk with your friends during your WWKIPD event. Each “hidden” pattern piece was designed to represent the location that it can be found in during the Sioux Falls Shop Hop. There are 2 textural patterns and 2 lacy patterns, 1 pattern incorporates optional beads and 1 incorporates optional metallic thread. If you are local, please support these amazing businesses that have been so supportive of our event by buying your supplies/treats from them. The local shops will only have the pattern pieces available during their individual business hours on 6/18/16, so check their sites (linked below) for times and plan accordingly if you won’t be with the main group. The online pattern pieces will only be available online until 11:59 PM (CST) on 6/18/16, so visit the links below at the times listed to get your pieces before they’re gone. If you still miss some of the pieces and/or want the entire pattern in my usual PDF format, don’t worry. I will be releasing the full pattern on 6/29/16. Those who have purchased the Info Sheet for the MKAL ($1) will get a free digital copy of the full pattern at that time. Regular price for this pattern will be $4.99, so sign-up now to get the discount and join in on the fun! 10-11 AM – The Bead Co. 2.) 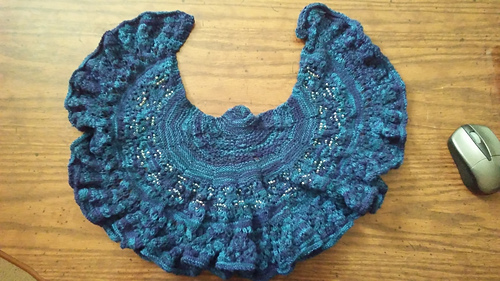 Yumi Yarns’ WWKIPD Mystery Knit-A-Long (For everyone else): Purchase your Info/Cast-On/Bind-Off pattern piece ($1) here then get your internet skills ready! Throughout the day on June 18, 2016 I will be posting the various pattern pieces across the internet on different platforms. Times listed are estimates, the pattern pieces will be up within 30 min of the listed time. All times are Central Standard Time Zone.